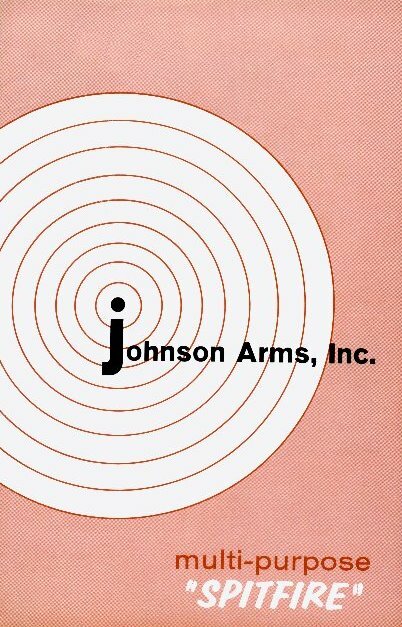 Shown here are a selection of Johnson Automatics and the later Johnson Arms Co. sales materials for mainly civilian sporting guns. 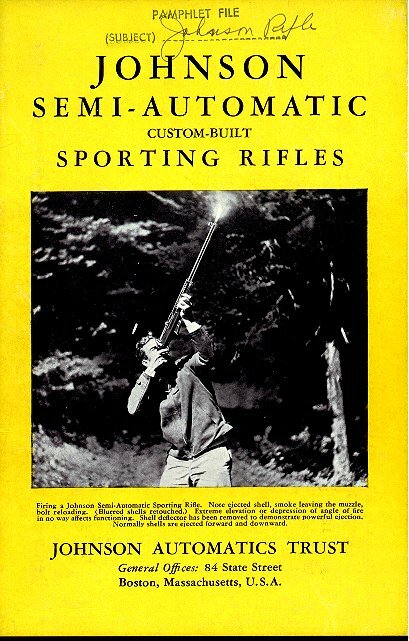 The first brochure issued by Johnson Automatics shows Mel Johnson on the cover with an early Johnson sporting rifle. Inside there are many photos of the rifle being fired and some early production features dropped from later models. 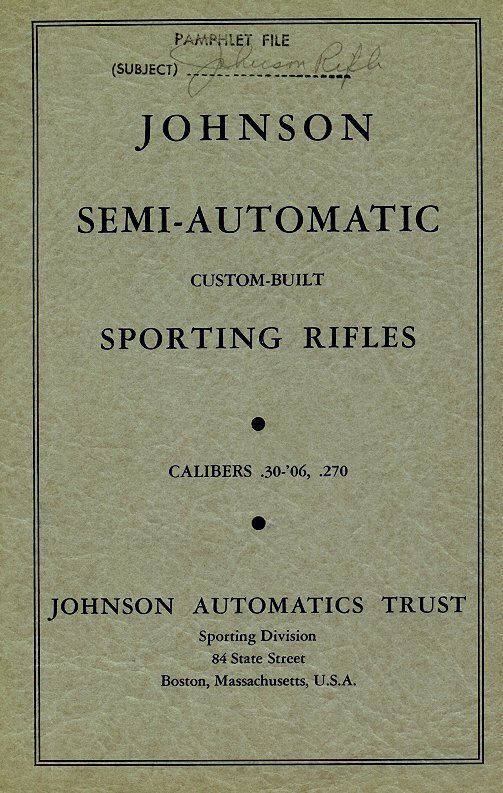 The rifles shown in this manual are the early ones made for Johnson by Marlin with only one photo of a military rifle. 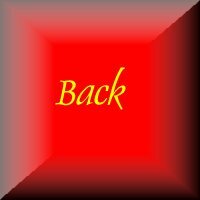 Toward the back is a small section on the LMG. The second brochure released by Johnson Automatics was in December 1938 and contains similar information as the first except it now shows a photo of the Taft-Peirce plant as the production facility. Expanded descriptions of the military rifles are included. The Johnson Automatics leaflet used after 1941 was a tri-fold paper which described all the Johnson military products then available. Showing the Johnson facility at Cranston on the cover with the large sign on the roof, however careful investigation reveals that this sign was in fact added to the print later by an artist! 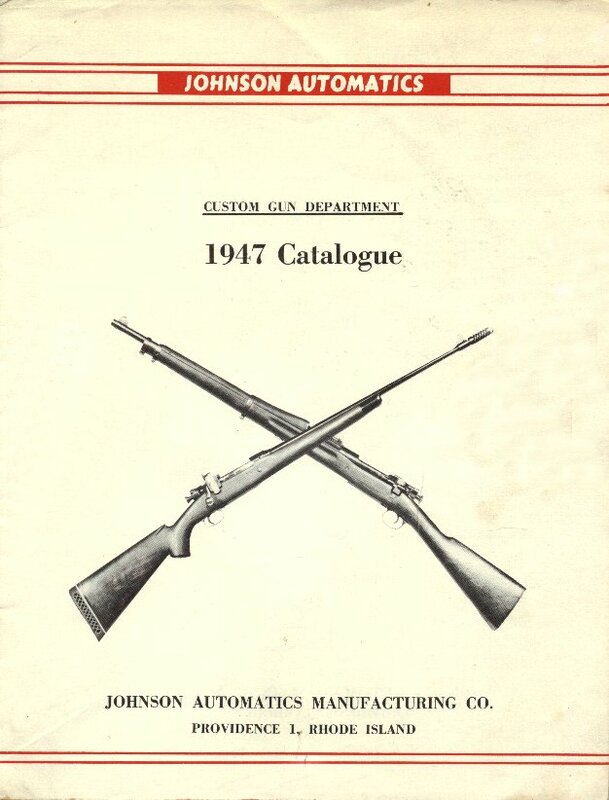 A post war Johnson brochure describing all of the services available to shooters who wanted to have their own (or Johnson supplied) surplus military rifles rebarrelled or sporterized into custom rifles. This one is from 1947, the 1948 version is virtually identical containing the same basic information about the conversions. 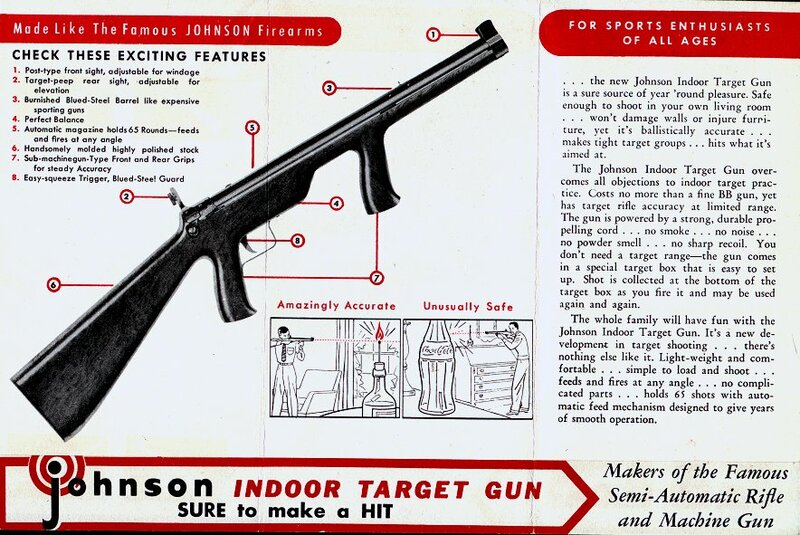 Dating from 1947 this is a small flyer for the Johnson Indoor Target Gun. A surgical elastic powered BB pellet gun designed by Johnson's in approx.. 1945. This little rifle had some novel features including a bakelite stock (same compound as used on the 1944 LMG) and a box that converted into a shooting gallery and backstop. A 1966 brochure for the Spitfire of the M1 Carbine conversion which Johnson was working on at the time of his death in 1965. Has a small obituary on the inside cover to him. Inside a lot on the various types of Spitfires available from the new company, Johnson Arms Co., plus all the accessories and loading dies that they made for them. A price list also came with the catalogue.